Seago Line handles intra-European container activities on behalf of the Maersk Group. 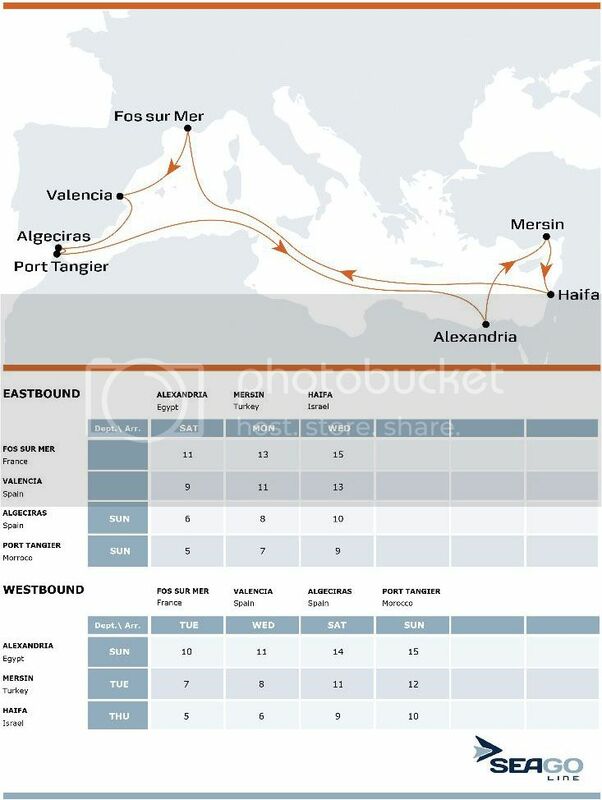 Eastbound: The ship leaves Algeciras port (Spain) on Sunday and arrives in Tangier port (Morroco) the same day. From Tangier it takes 5 days to reach Alexandria port (Egypt) on the Saturday of the same week, 7 for Mersin port (Turkey) and 9 for Haifa port (Israel). Therefore, it takes 2 days to complete both the Alexandria-Mersin and Mersin-Haifa journey. Westbound: The ship reaches Alexandria port on Saturday, but leaves the next day on Sunday. It departs from Mersin port 2 days later on Tuesday, departs from Haifa port on Thursday. From Haifa port it takes 5 days to reach Fos Sur Mer port (France), 6 for Valencia port (Spain), 9 for Algeciras and 10 for Tangier. The important point to note is that a shipment sent from Tangier to Alexandria will arrive in 5 days, but a shipment from Alexandria to Tangier will take 15!